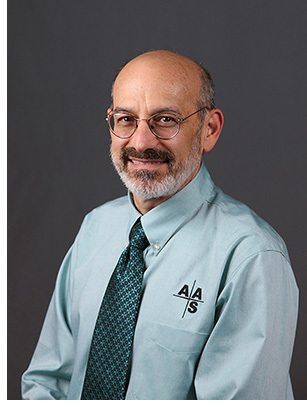 Dr. Rick Fienberg is the American Astronomical Society’s Press Officer. From 1986 to 2008 he served in a variety of editorial and management positions at Sky & Telescope magazine, including eight years as Editor in Chief. He spent the 2008-2009 academic year as Visiting Scientist in Astronomy & Astrophysics at Phillips Academy, the prestigious college-preparatory school in Andover, Massachusetts. Rick earned his BA in physics at Rice University and his MA and PhD in astronomy at Harvard University; he has done research on the aurora borealis, asteroids, planetary nebulae, active galaxies, and the center of the Milky Way. He is a co-creator of the Galileoscope educational telescope kit, a Cornerstone Project of the International Year of Astronomy 2009 and the International Year of Light 2015. Rick is an elected Fellow of the American Association for the Advancement of Science (AAAS). The International Astronomical Union (IAU), which he serves as President of Commission C2, Communicating Astronomy with the Public, has named asteroid 9983 Rickfienberg in his honor. In 2018 NASA awarded him its Exceptional Public Achievement Medal "for exceptional service to the nation in [his] tireless efforts for the public's safe solar viewing of the 2017 total solar eclipse." Though trained as a professional astronomer, Rick remains an amateur at heart, observing the sky and taking astrophotos from his private observatory in central New Hampshire. An inveterate traveler, often in pursuit of total solar eclipses, Rick has visited all seven continents and the North and South Poles.